Women are twice as likely to suffer extreme anxiety when visiting a dentist compared to men, according to a government survey of dental health. The study found 19% of women suffered extreme anxiety in the waiting room compared to 10% of men in England, Wales and Northern Ireland. 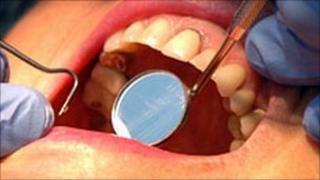 The research, carried out by the Office of National Statistics, also looked at dental health. People in Wales had the worst problems, it found. Overall, dental health had improved across all three countries. But the survey showed that a greater percentage of the Welsh population have no natural teeth and higher levels of tooth decay. One in 10 adults in Wales has no natural teeth. In England the figure is one in 17 and in Northern Ireland it is one in 14. It was the largest ever survey of adult dental health in the three countries. More than 11,300 individuals were interviewed and 6,469 adults were examined.